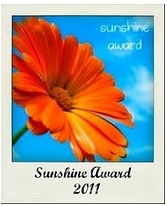 for awarding me with the Sunshine Award! I am blessed! Giving or getting presents? I love giving presents, sometimes I can't even wait till the event. If I have it in the house, I have to give it to you! 3. Here are some fabulous blogs that have added sunshine to my life ever since I entered the amazing world of blogging. There are so many more, so just know that if I have ever stopped over at your blog and hung out for a while, you have touched my life with sunshine and rainbows! Thanks so much for the bit of Sunshine! Janine, thank you so much!! YOU have always been the sunshine for me, with your support and thoughtful words! I love my milk really cold too, one of my faves! Thank you so much! I love your positivity and enthusiasm! I just saw this, so I am sorry for the delay. Your comment got lost in my spam folder. :( Anyway, you are awesome! Thanks for the shout out!